Glass square tip pipe is about 5 inches long. It has square mouth. This hand pipe has the multi colors so we try our best to send the right color. Pros: Very thick. Extremely wide, if that's what you like. Wide carb, for big hits. The square mouth piece keeps it from rolling. Cons: Extremely wide, if that's what you don't like. Comments: Not as pretty as the picture. Pros: Nice big 5 inch pipe. Bowl is deep enough to smoke with a few friends but also just fine for one person. Has a square bottom so it can sit on any surface without falling over. 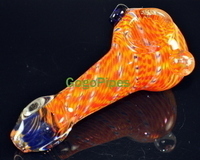 The coloring of oranges and blues on the pipe I received was a bit different than the one pictured (which should be expected). Pipe still looks great though. For the price, you cannot beat the overall quality. Cons: Only had it for a few days but no Cons yet. Pros: Sweet looking (looks better in person) THICK, concealable, just all over a good pipe.